We build Classic attached garages in a wide variety of types of construction and style. 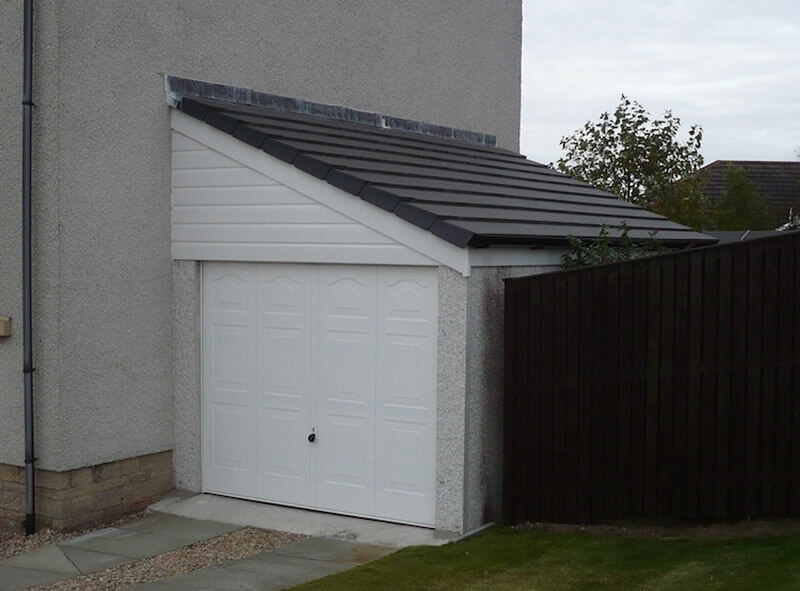 Our pre-cast concrete range of garages are perfectly suited to attaching to a house. They can be designed with a flat roof, a lean-to roof, a sheeted, tiled or slated roof. A garage of any sort attached to your house may not require Planning permission but will in all cases require Building Warrant approval from the local authority. We will be able to apply for that on your behalf and we can provide you advice on how to satisfy the Building Regulations with regard to fire resistance, drainage connections, etc. Attached garages are usually single width garages up to about 13’0″ to 14’0″. The length can be anything from 16’0″ long for a small car up to 40’0″ long to accommodate two cars and a workshop. If necessary we can provide a proposal and quotation for attached garages which are up to 20’0″ wide to accommodate two cars side by side. If you are very tight for space at the side of your house remember that you do not have to leave a gap for wheelie bins since we can provide you with a door on the back of your garage wide enough to allow wheelie bins, lawnmowers, wheelbarrows, etc through. We apply the roughcast colour of your choice during manufacture with over 30 choices available. Our surveyor will recommend the best colour to compliment your home. Click on our finishes page to see some of the most popular colours. On an attached garage we are able to offer flat sheeted roofs, lean-to sheeted roofs, lean-to tiled or slated roofs or roofs with a fore and aft elevation finished in tiles or slates and sloping down toward gutters at the front and rear.